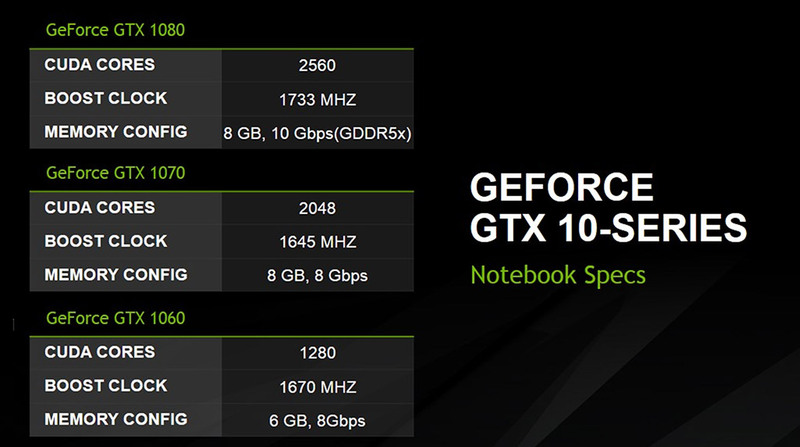 GeForce GTX 10 Series Notebooks - a Revolution in Mobile Gaming. "It’s a well-known fact that using a laptop as your primary gaming PC means a compromise to performance..." - Pub PC Expert. That certainly used to be the case, until now.  You’ll immediately notice that the “M” for “Mobile” suffix has been dropped for all 10 series GPUs, and that’s because Chillblast laptops powered by NVIDIA GeForce 10 series video cards have exactly the same GPUs under the hood as their desktop counterparts. A GeForce GTX 1080 in one of our desktop PCs has 2560 CUDA cores, a 256-bit memory bus width and a boost clock of 1733 MHz. The laptop variant in our Messiah laptop has 2560 CUDA cores, a 256-bit memory bus width and a boost clock of 1733… you get the idea. This incredible performance bump – up to twice the performance of the previous generation - is all thanks to NVIDA technological developments under the hood. 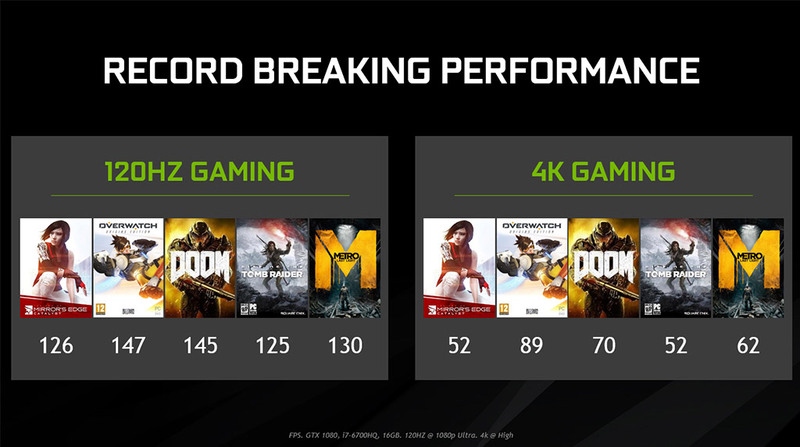 The GeForce GTX 10 series – codename “Pascal” - is incredibly power-efficient, allowing desktop class performance to be realised in a much smaller form factor. 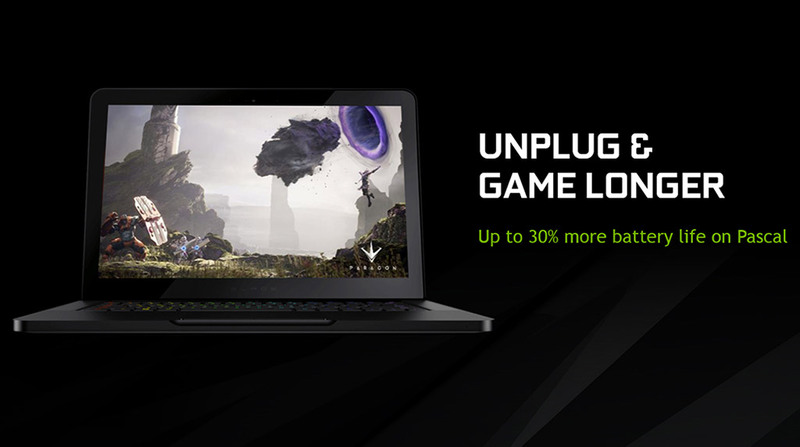 Intelligent NVIDIA Optimus technologies also give great battery life on gaming notebooks when the dedicated GPU is turned off, and ensure quiet, cool running, meaning a gaming laptop is the only mobile device you need. The incredible power efficiency of Pascal also enables slimmer-than-ever gaming notebooks. Our stunning Samurai 1080, for example, delivers 60fps at 1080, maximum detail desktop class gaming in a chassis only 17.7mm thick. If you’ve been put off investing in a gaming laptop previously because of bulky chassis, compromised performance and poor battery life in the past, it’s time to put old myths to bed and reconsider the incredible performance a modern 10-series powered laptop enables.